AmalgaNation » The Centre Ring » Anime, Manga and Graphic Novels » Graphic Novels » MAD - We're all just raving mad!! Well for starters, this isn't a graphic novel but rather a satirical cartoon magazine. And its ancient. 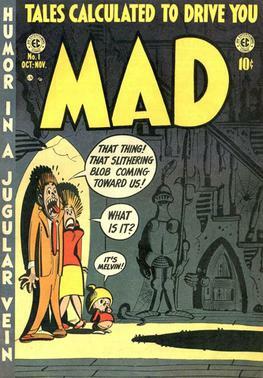 "Mad is an American humor magazine founded by editor Harvey Kurtzman and publisher William Gaines in 1952. Launched as a comic book before it became a magazine, it was widely imitated and influential, impacting not only satirical media but the entire cultural landscape of the 20th century. The last surviving title from the notorious and critically acclaimed EC Comics line, the magazine offers satire on all aspects of life and popular culture, politics, entertainment, and public figures. Its format is divided into a number of recurring segments such as TV and movie parodies, as well as freeform articles. Mad's mascot, Alfred E. Neuman, is typically the focal point of the magazine's cover, with his face often replacing a celebrity or character that is lampooned within the issue." So you have a fair idea how influencial this controversial magazine was. One big bad example of the influence of this magazine is Rock n Roll Legend Jim Morrison. He was a big fan of MAD when he was a kid and probably wouldnt have become the Rock God that he became if he hadnt been influenced by this magazine in his childhood. My guitar teacher is a big fan of MAD. So thats where I got to hear of this magazine from. I read a couple of issues. And I was blown away by the beautiful satire. It can be aptly called ART.